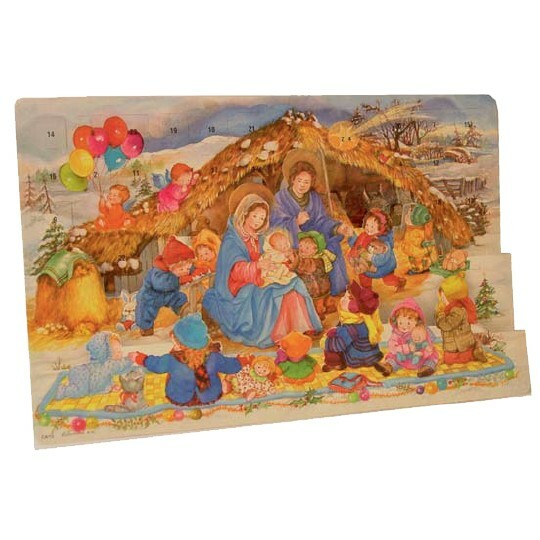 This large advent calendar features an image of Santa with a lantern and bag of toys. It has 24 numbered windows to open, one for each day in the countdown to Christmas. Measures 16-1/4" tall x 10" wide. Printed in Spain. 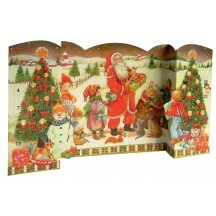 This large 3D standing advent calendar features a snowy scene of Santa and children with trees and gifts. 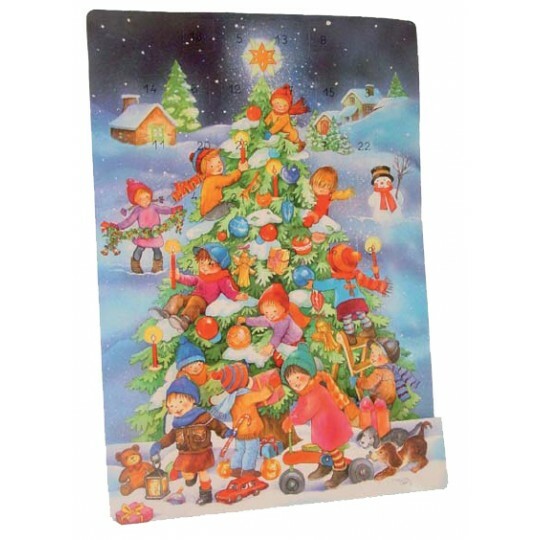 It has 24 numbered windows to open, one for each day in the countdown to Christmas. Measures 11-1/2" tall x 21" wide when standing; and 16" wide x 11-1/2" tall when flat. Printed in Spain. This large advent calendar features an adorable image of children decorating their Christmas tree. 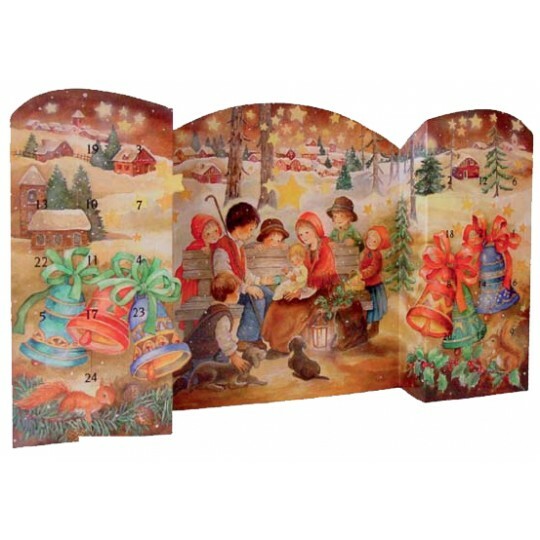 It will stand as long as the back is supported -- there is a small front panel with the children with candles and their pets that folds forward. It has 24 numbered windows to open, one for each day in the countdown to Christmas. Measures 16" tall x 11-1/2" wide. Printed in Spain. 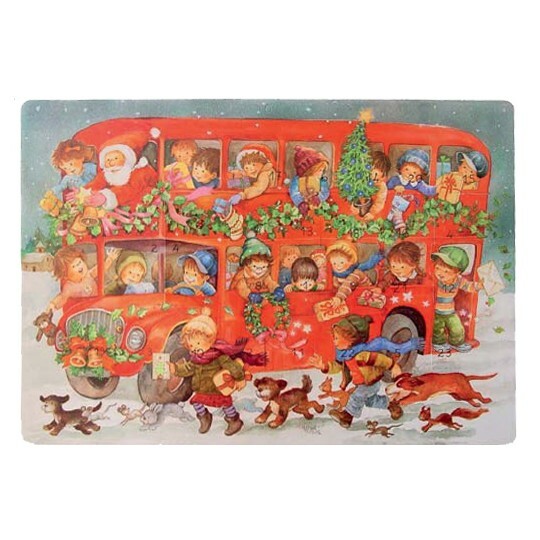 This large advent calendar features an adorable image of Santa with children in a red double decker bus. It has 24 numbered windows to open, one for each day in the countdown to Christmas. Measures 16-1/4" wide x 9-1/4" tall. Printed in Spain. 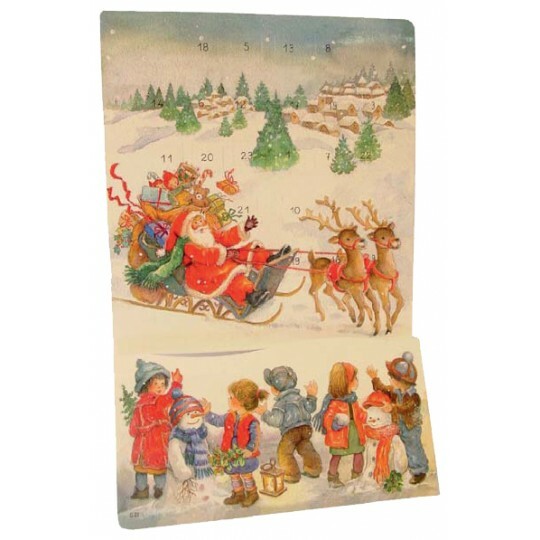 This large advent calendar features an image of Santa arriving in his toy-laden sled to greet a group of children building a snowman. 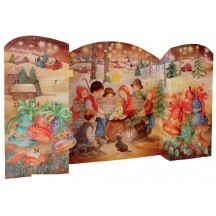 It will stand as long as the back is supported -- there is a small front panel with the children that folds forward. It has 24 numbered windows to open, one for each day in the countdown to Christmas. Measures 15-1/2" tall x 10-3/4" wide. Printed in Spain. This large advent calendar features a colorful nativity image with children. It will stand as long as the back is supported -- there are two small front panels that fold forward. It has 24 numbered windows to open, one for each day in the countdown to Christmas. Measures 9-1/4" tall x 16-1/4" wide. Printed in Spain. This large 3D standing advent calendar features a beautiful nativity image with classic Christmas trees, candles and pine cones. 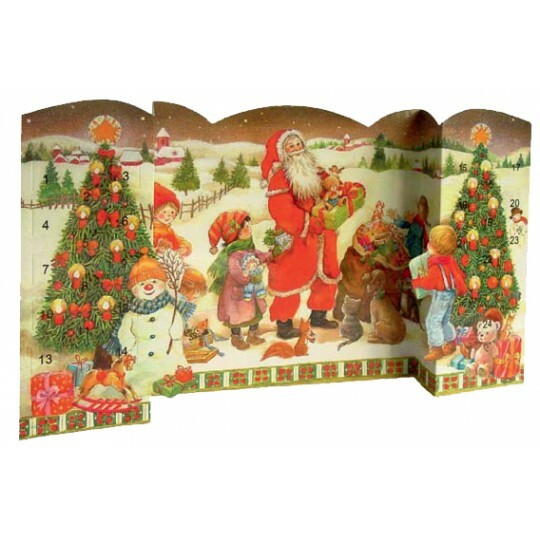 It has 24 numbered windows to open, one for each day in the countdown to Christmas. Measures 11-3/4" tall x 21" wide when standing; and just over 16" wide x 11-3/4" tall when flat. Printed in Spain. 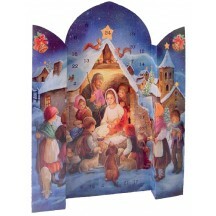 This large 3D standing advent calendar features a beautiful nighttime nativity image with children. 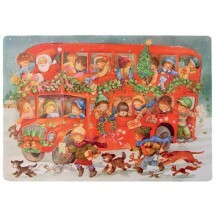 It has 24 numbered windows to open, one for each day in the countdown to Christmas. 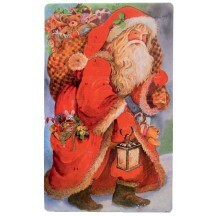 Measures 11-1/2" tall x 14-3/4" wide when standing; and 11-1/2" wide x 16-1/2" tall when flat. Printed in Spain. 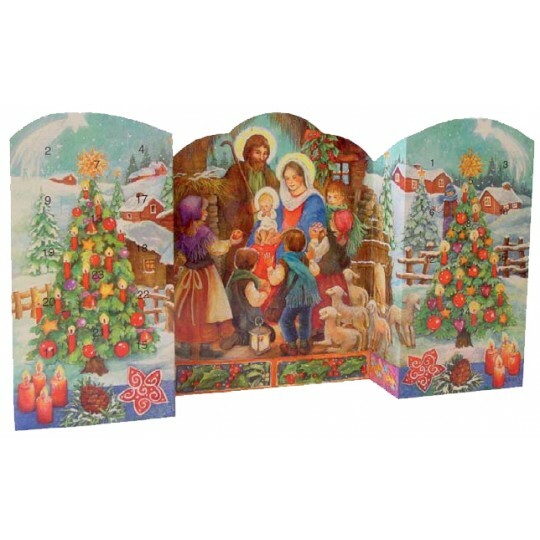 This large 3D standing advent calendar features a beautiful nativity image of children with colorful bells, greenery and squirrels. It has 24 numbered windows to open, one for each day in the countdown to Christmas. Measures 11-1/4" tall x 21" wide when standing; and 16" wide x 11-1/4" tall when flat. Printed in Spain.